Check out our parts pages. 1,000s of parts in stock. Check out our events directory pages. Search for Classic Car Parts From Clutch Slave Cylinders for Mitsubishi's to Rocker Cover Gasket for Suzuki's, we have a huge range of parts for many classic vehicles. With the clocks changed, there's more daylight to enjoy that restoration work or weekend event. These events are updated weekly (Sunday evening generally). Check back again next week for the latest events. 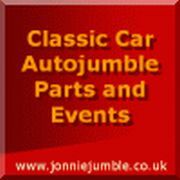 Latest Autojumbles and Events : ~ 22.Apr : Ashford Classic Motorcycle Show and Bikejumble ~ 25.Apr : Torbay MG Owners Club Monthly Meet ~ 27.Apr : Lincoln Autojumble ~ 28.Apr : Cheshire Boat Jumble and Small Boat Sale ~ 2.May : B5000 Barbers Monthly Vehicle Meet ~ 3.May : Abbey Hill Steam Rally ~ 4.May : Heritage Steam Gala ~ 5.May : Irvine Spring Boat Jumble ~ 6.May : Ilkley Carnival Classic Motor Show ~ 10.May : Nostalgia Nationals ~ 11.May : Bill Targett Memorial Steam Rally ~ 12.May : Solent Spring Boat Jumble ~ : : : : check our listings. This Monday 22nd April sees the Ashford Classic Motorcycle Show and Bikejumble at Ashford Livestock Market, Kent. On the 25th April it's the Torbay MG Owners Club Monthly Meet at Dainton Park Golf Club, Newton Abbot, and on Saturday 27th the Lincoln Autojumble at Hangar Number One, Hemswell. Following that on Sunday 28th the Cheshire Boat Jumble and Small Boat Sale at Brookfield Farm, Holmes Chapel, and then on the 2nd it's the B5000 Barbers Monthly Vehicle Meet at Birch Coppice Club, Dordon. The events are kept as up to date as possible, but sometimes things change last minute and we don't always get informed. On most of the event pages there is a phone number, email or dedicated event website. Be certain that an event is taking place, before heading off. Find regional events, owners clubs, museums and classic car restoration courses. Find local and regional autojumbles and Classic Car Events. Lookings for something interesting and indoors? Try our list of UK Classic Car Museums. Read our classic car jokes or have a go at the classic car quiz. Whether you are looking for something particular or just browsing jonnie has 1000s of parts in stock. Thinking of buying a classic car of your own? Read our essential guide. This week we feature the Beamish in County Durham. It Covers all stages of vehicle interior enhancement, from cleaning and tidying, through to stripping out and replacing upholstery, repairing seat frames, and renewing trim panels. 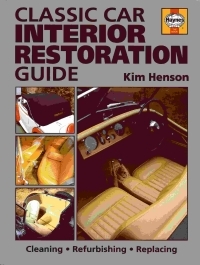 Other chapters describe how to cure water leaks, rust damage, re-colouring vinyl trim, feeding and maintaining leather upholstery, facia and door capping renovation and dealing with headlinings. Useful contact addresses are included in the appendices.